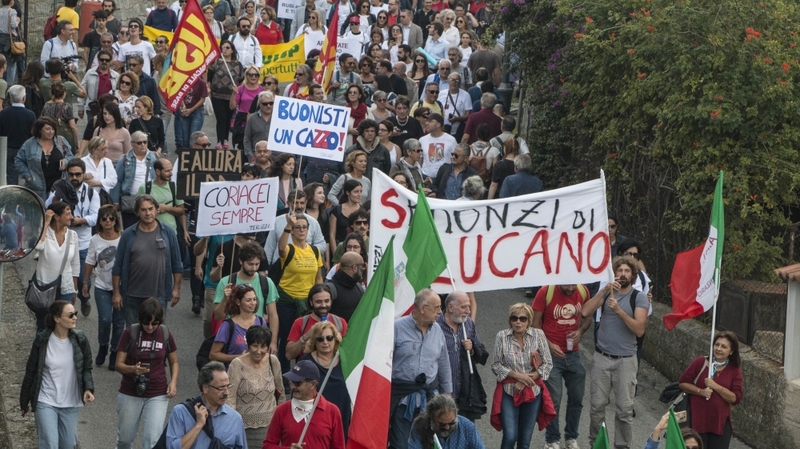 Riace, Italy – An estimated 6,000 people protested in Riace, a small village perched on top of a barren hill in the southern Italian region of Calabria, against the arrest of its mayor Domenico Lucano. Known as the “refugee mayor”, he stands accused of aiding and abetting illegal migration. The mayor was put under house arrest October 2 as the state accuses him of facilitating “marriages of convenience”. In a wiretapped conversation, he’s heard talking about ways of obtaining a residency permit for a Nigerian woman who has been denied international protection three times. He is also accused of irregularities in allocating contracts for trash collection services run by refugees. The arrest came after a year-long investigation into the management of funds for refugees in the town, which saw the mayor investigated for racketeering, embezzlement and fraud, alongside 31 others. A preliminary examination judge didn’t find enough evidence to support those charges.